NASA's Curiosity rover has seven cameras mounted on its mast, including the two-camera, full-color Mastcam system; the four-camera, black-and-white Navcam system; and ChemCam, which monitors the effects of the rover's laser blasts. 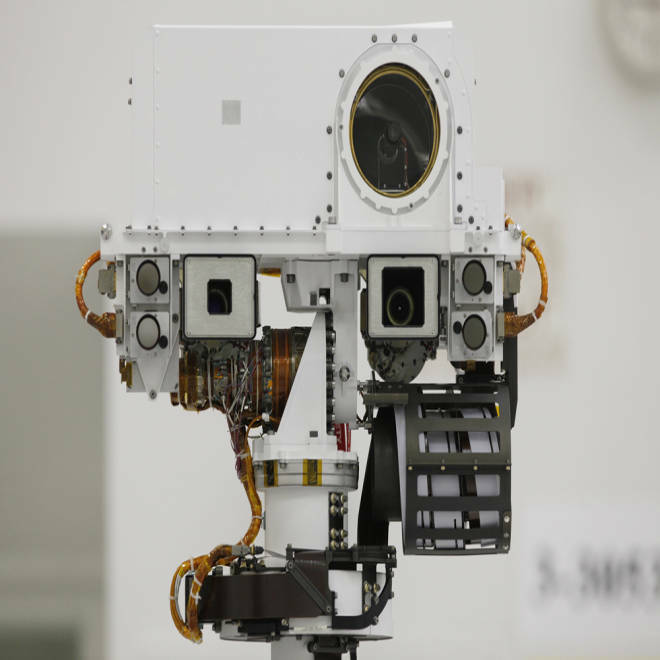 The Mars Hand Lens Imager is one of the instruments on the rover's robotic arm, the Mars Descent Imager is mounted on the robot's belly, and the eight-camera Hazcam system rounds out Curiosity's array of 17 cameras. The 17 cameras on NASA's Curiosity rover are capable of sending back unprecedented, jaw-dropping, full-color views of Mars — but don't expect to be wowed by the first images. In fact, they just might be literally the size of postage stamps, in black and white. 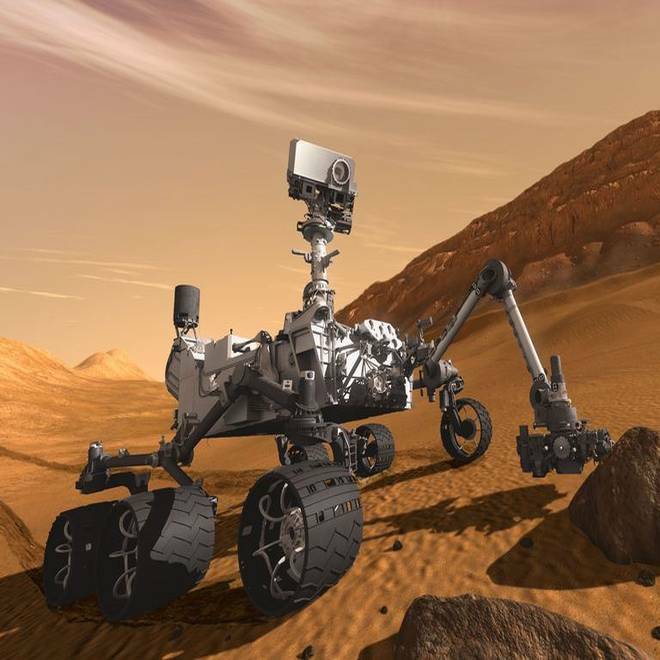 Millions of people will be watching NASA's coverage of Curiosity's landing at 10:31 p.m. PT Sunday (1:31 a.m. ET Monday), on displays ranging from palm-sized smartphone screens to the giant screen in New York's Times Square. If the landing is successful, the first thing we'll see is bunches of grown men and women acting like giddy teenagers, pointing at blips on their computer monitors. What we definitely won't see are the 2-megapixel, color images that Curiosity's best cameras are capable of capturing. Instead, we might see 64-by-64-pixel, black-and-white thumbnails from the rover's hazard avoidance cameras, or Hazcams. If NASA's Mars Odyssey orbiter has time to relay more data from Curiosity, they might be 256 pixels square. Or there might be no pictures at all, just because Odyssey wasn't able to acquire enough of a signal fast enough. In that case, we'll have to wait for Odyssey's second orbital pass, at around 12:45 a.m. PT Sunday (3:45 a.m. ET Monday). The fisheye-view Hazcam images sent during that opportunity could be 512 pixels square or maybe even 1,024 pixels square. There's a simple reason why we won't be seeing the big, beautiful pictures from the cameras built into Curiosity's mast: That mast, which rises 6.5 feet (2 meters) above the Martian surface when fully extended, won't be deployed until later in the week. First, the rover's eight Hazcams (four looking forward, four looking backward) will have to do a quick check of the surroundings. A couple of gems could become available later Monday. For instance, there might be a picture from NASA's Mars Reconnaissance Orbiter, showing Curiosity and the rest of the $2.5 billion Mars Science Laboratory payload descending through the Red Planet's atmosphere. MRO was able to snap a picture of the Phoenix Mars Lander's descent in 2008, and if the orbiter captures a similar view this time around, that could be released around 9 a.m. PT (noon ET) Monday. The first thumbnails from Curiosity's Mars Descent Imager could be released around 4 p.m. PT (7 p.m. ET) Monday. That camera, also known as MARDI, should have recorded a sequence of color frames looking down from the rover during its descent, and once they're all relayed back to Earth and put together, they'll make for a great movie. By Wednesday, the rover could be sticking out its robotic arm to let the Mars Hand Lens Imager, or MAHLI, take a full-color picture of the ground surrounding Curiosity. The mast should be raised around this time as well. First, the navigation camera system, or Navcam, is due to send back some nice, quick black-and-white views. By Thursday, the full-color Mastcam system is expected to be sending back wide-angle and fixed-zoom images. Mastcam promises to be the star of the show once the mission hits full stride: The system's right-eye camera has a telephoto lens, capable of reading the "ONE CENT" lettering on a penny on the ground beside the rover, or distinguishing between a basketball and a football at a distance of seven football fields (roughly 700 yards or meters). It's called "Mastcam 100" because of the camera lens' 100mm focal length. The left-eye camera (Mastcam 34) has a wide-angle, 34mm lens that captures a scene three times wider. It can snap 15 images in about 25 minutes to create a full-color, 360-degree panorama. Both cameras can record high-definition video at 5 frames per second, and the pictures can be combined for 3-D views. The seven cameras on Curiosity's mast include ChemCam, visible as a large lens at top right; the wide-angle and telephoto Mastcam cameras, visible as two rectangular eyes below ChemCam; and the four-camera Navcam system, visible as smaller round lenses to the left and right of the Mastcam pair. These pictures show what the wide-angle and telephoto cameras of the Mastcam system could see at a distance of 10 meters (33 feet). The top image (Mastcam 34 equivalent) covers an area about 14 feet (4.3 meters) across and has a resolution of one-third of an inch (0.84 centimeter). The bottom image (Mastcam 100 equivalent) covers an area 61 inches (1.55 meters) across and has a resolution of one-eleventh of an inch (less than a quarter of a centimeter). The panoramic cameras on NASA's Spirit and Opportunity rovers had to take multiple images using different filters to create color pictures, but the imaging chip used in each of Curiosity's Mastcam cameras is built to produce full-color views with one snap. "It's identical to what most consumer cameras have," said Justin Maki of NASA's Jet Propulsion Laboratory, who's a co-investigator on the Mastcam team and the lead engineer for the Hazcam and Navcam systems. The Navcam system has four cameras, which are set up to produce left-eye and right-eye views in black and white. (Each "eye" is doubled up for redundancy's sake.) The Curiosity team will rely on the Navcam views to plot the rover's course during the two-year mission. It takes just 10 minutes for Navcam to produce a 360-degree panorama. "Rover missions are highly dependent on the images," Maki explained. "The entire mission is occurring within the images we receive. ... When we land, we actually start with that first panorama. We bootstrap ourselves starting with that first images, and then we drive into those images and do it again." The MAHLI ("Molly") camera serves as the equivalent of the hand lens typically used by geologists to take a close look at rocks. It's similar to but more capable than the Microscopic Imager used on Spirit and Opportunity. At closest range (about 0.8 inch, or 21 millimeters), MAHLI can achieve a resolution of 14 microns (less than a thousandth of an inch). Its images will be in full color, which is a step above the Microscopic Imager's black-and-white views. MAHLI can use LED lighting to illuminate its target. And it can be focused at different ranges to produce microscopic detail in depth. Because MAHLI is mounted on Curiosity's robotic arm, which can be extended to a distance of 6.2 feet (1.9 meters) from the front of the rover's body, that camera can be raised to see over an obstacle that blocks Mastcam's view. It can also be turned around to take a nifty self-portrait of the rover. The black-and-white ChemCam camera, situated at the top of Curiosity's mast, can be used to study soil and rocks from a distance, but it also serves a specialized purpose: to observe the sparks given off by the rover's rock-zapping laser. The light from those zaps will also be analyzed by three spectrometers inside the rover to determine a rock's chemical composition. Curiosity may be more loaded up with imaging technology than the geekiest camera-toting tourist, but it's good to keep a sense of perspective here. This mission is not just about the technology. The point is get the best view available of terrain that rises more than 3 miles (5 kilometers) above the floor of Gale Crater, potentially recording billions of years of geological change. That's something that will make Curiosity's vistas unlike any seen before. "The biggest difference is that we're landing next to a mountain, so the images are going to be spectacular even if they're in black and white," Maki told me. "The most exciting thing is where we're going."